Our Abpromise guarantee covers the use of ab46512 in the following tested applications. IHC-P 1/8000. Perform heat mediated antigen retrieval via the microwave method before commencing with IHC staining protocol. WB 1/1000. Predicted molecular weight: 100 kDa. mCLCA3 (alias gob-5) is the third murine member of the family of calcium-activated chloride channels (CLCA-family). mCLCA3 plays a role in diseases with secretory dysfunctions, including asthma and cystic fibrosis. The mCLCA3 protein is located in mucin granule membranes of goblet cells of the intestinal, respiratory and reproductive tracts. It is also secreted into the mucin layer on mucosal membranes. The protein appears to be involved in the synthesis, condensation or secretion of mucins. 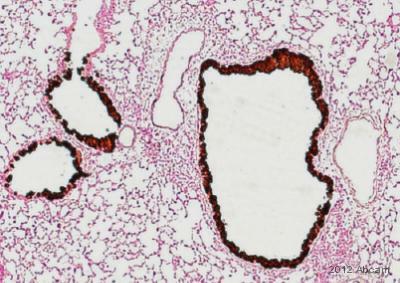 Formalin-fixed, paraffin-embedded mouse colon tissue sections stained with anti-CLCA3 ab46512 used at 1/8000 dilution. Additional bands at: 16 kDa, 95 kDa. We are unsure as to the identity of these extra bands. CLCA3 contains a number of potential glycosylation sites (SwissProt) which may explain its migration at a higher molecular weight than predicted. ICC/IF image of ab46512 stained MEF1 cells. The cells were 4% PFA fixed (10mins) and then incubated in 1%BSA / 10% normal goat serum / 0.3M glycine in 0.1% PBS-Tween for 1h to permeabilise the cells and block non-specific protein-protein interactions. The cells were then incubated with the antibody (ab46512, 1/200 dilution) overnight at +4°C. The secondary antibody (green) was ab96899 Dylight 488 goat anti-rabbit IgG (H+L) used at a 1/250 dilution for 1h. Alexa Fluor® 594 WGA was used to label plasma membranes (red) at a 1/200 dilution for 1h. DAPI was used to stain the cell nuclei (blue) at a concentration of 1.43µM. Publishing research using ab46512? Please let us know so that we can cite the reference in this datasheet. Thank you very much for your interest in ab46512. To our knowledge, ab46512 has not been tested in frozen tissue sections (IHC-Fr). There is no reason that I can see that it wouldn't work, but since we haven't tested it in IHC-Fr we wouldn't be able to guarantee it. Therefore, I can offer a discount off a future purchase if you buy ab46512 now, test it in IHC-Fr and submit feedback to us in the form of an Abreview. It doesn’t matter whether the Abreview is positive or negative, we would just really like to receive your feedback. The discount would be to the value of 1 free primary antibody. If you are interested in this offer, please follow these steps: 1. Reply to this e-mail to let me know that you would like to proceed and test ab46512 in IHC-Fr. I will then send a discount code. This code must be issued before purchasing ab46512 so please wait for my reply before ordering. 2. Purchase ab46512 either by phone, fax, or online (www.abcam.com). 3. Test it in IHC-Fr. 4. Let us know the results, positive or negative, using our Abreview system (this will take about 10 minutes and images are great if you have them!). To find out how to submit an Abreview, please visit: https://www.abcam.com/abreviews. 5. After the review is submitted to us, the discount code becomes active. Simply place your new order by phone, fax, or on the web and mention the discount code. The discount can be redeemed for any primary antibody ordered and the discount code is valid for 4 months after issue. We are always pleased to obtain feedback about our products and any information is greatly appreciated! Even if ab46512 turns out to be unsuitable for IHC-Fr, you will still receive the discount on your next purchase after your Abreview has been submitted. Please let me know if you have any questions about this offer and I would be happy to help you further. The Terms and Conditions of this offer can be found at: www.abcam.com/collaborationdiscount.